What is Fracture of the Ulnar Styloid? Different bones may be involved in a fracture of the wrist joint, though the most common type of wrist fracture occurs at the end of the radius bone of the forearm. The bone is known as the distal radius and fractures associated with it are known as distal radius fractures. Ulnar styloid fractures are present in association with most distal radio-ulnar joint instability. The ulnar styloid is present at the end of the other bone of the forearm, known as the ulna. The ulnar styloid fractures extend from the distal tip to the fractures at the base of the styloid. 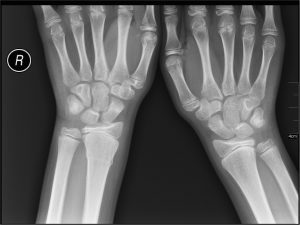 Ulnar styloid fracture is common in children and young adults involved in impact activities and in elderly people who are at an increased risk of falls and osteoporosis. The most common cause of this type of fracture is a fall on an outstretched arm. A traumatic stress on the arm like that experienced in a road accident or a fall from a significant height can cause this fracture. Also, patients with metabolic bone diseases and osteoporosis are at an increased risk of developing these fractures. A patient with a suspected ulnar styloid fracture must be taken to a hospital emergency room. Following immediate medical care, an orthopaedic surgeon who specializes in the treatment of bone disorders can suggest further course of action. A doctor conducts a physical exam to check for swelling, bruising, pain in the affected area, and range of movement in the wrist. An x-ray is conducted to view the fracture. A fractured ulnar styloid process may not be diagnosed correctly in case it is not accompanied by a displacement, as the X-rays would be unclear in such a condition. While distal radius fractures are placed in a cast for treatment, ulnar styloid fractures rarely require treatment when they occur in association with a distal radius fracture. However, in case the distal radius joint (or the joint between these two bones) is unstable, the ulnar styloid requires independent treatment. However, most distal radius fractures associated with ulnar styloid fractures take place without this instability. In fact, a study of patients with distal radius fractures showed that their prognosis was not affected by the presence or absence of ulnar styloid fracture. It also showed that the prognosis was unaffected by both displacement (ulnar styloid fracture being out of position) and non-union (ulnar styloid fracture does not heal). A minimally displaced or undisplaced ulnar styloid fracture or a styloid fracture that reduces with the reduction of the distal radius can be placed in a long arm cast in a mid-horizontal position for about three to four weeks. Fractures at the base are more likely to cause instability of the distal radio-ulnar joint. A closed reduction may be carried out and internally fixated with a K wore, a wire loop or suture, or a screw or an open reduction may be required to achieve the required stability. The above study showed that surgical treatment of an ulnar styloid fracture when occurring in association with a distal radius fracture is not required. Also, read about: Which food is good for eyes? Regular follow-up visits and x-rays check the reduction following treatment. The patient is encouraged to start functional exercises soon after the injury; mobilisation of fingers, elbow and shoulder and elevation of the limb is attempted. However, it may take several weeks before a patient may start active wrist and forearm motion; adequate rest and immobilisation are also necessary. Resistance exercises are gradually introduced into the rehabilitation programme. Call +91-8010-994-994 and talk to Credi Medical Experts for FREE. Get assistance in choosing the right Orthopedist, compare treatment cost from various hospitals and get support in managing other hospital processes.